Our excursions are held in the charming area of the Pisan Hills, a marvellous setting of picturesque small villages, peaceful gravel roads and enchanting rolling hills spotted by typical farmhouses. Our guides are licensed horseriding guides and teachers with a particularly deep knowledge of the territory and fluent English. 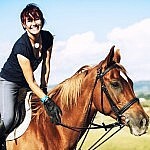 Our horses are very well trained and peaceful, ideal for any kind of rider. Our guides invite riders to help them clean and saddle the horses before leaving, which is an excellent way for horses and riders to familiarize. The kind or riding is English style. Level of difficulty: low, ideal for beginners and riders with little experience. Gait: walk, some parts of trot or gallop for experienced riders only. Itinerary: gravel roads and pathways on the hills around Lari, a charming medieval town near Pisa. Groups: single riders or couples may join a mixed group. Clothing: comfortable shoes and wear are recommended. Helms are provided and boots can be provided if necessary. Julie is a very experienced horse riding trainer and guide who works at a spectacular agriturismo in central Tuscany, near Volterra. Her riding ground is available for easy pony rides for children as well as for excursions in the beautiful Tuscan hills on horseback. The total rate for this activity varies according to the duration of the excursion and the number of participants. This is an email we received from Andreas & Nazanin, who spent some days in Tuscany on the occasion of the concert of Andrea Bocelli at Teatro del Silenzio and booked a speciality tasting tour and a horse riding excursion with us. We just want to say thank you for a great trip, which we will remember for the rest of our lives. Thank you for the restaurant and the arrangement with the flowers it was perfect. We also had a wonderful trip with Massimo! I really wish we could have had a good trip with the horses and I am very sad that we missed the cooking class, maybe we will come back another time. Thank you for the great service of offering the dinner, we also enjoyed that a lot. Although Nazanin had some problems with her wrist and her back we managed to walk a little around in pisa and florence before we went back. 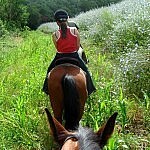 Our horse riding excursions take place at an agriturismo in the countryside between Volterra and Pisa. Unless differently specified, the meeting point with horse riding teacher is at the agriturismo, near Volterra. Detailled instructions will be provided. This program takes 1.5 hours. Time for reaching the meeting point not included. Available all the year through. Availability is subject to weather conditions and to the timetable at the riding ground. Please, define timings at the booking procedure. This excursion is available in English or Italian with no surcharge. Ideal for children over 8 who are experienced at riding. Children under 8 years are not allowed to ride horses but can experience a pony ride at the riding ground. Comfortable clothes are recommended. To avoid bites of insects, sandals, shorts and T-shirts are not suitable. Riders must bring any drug they make use of in case of allergies. They also must inform the guides in case of allergies towards common medicines. 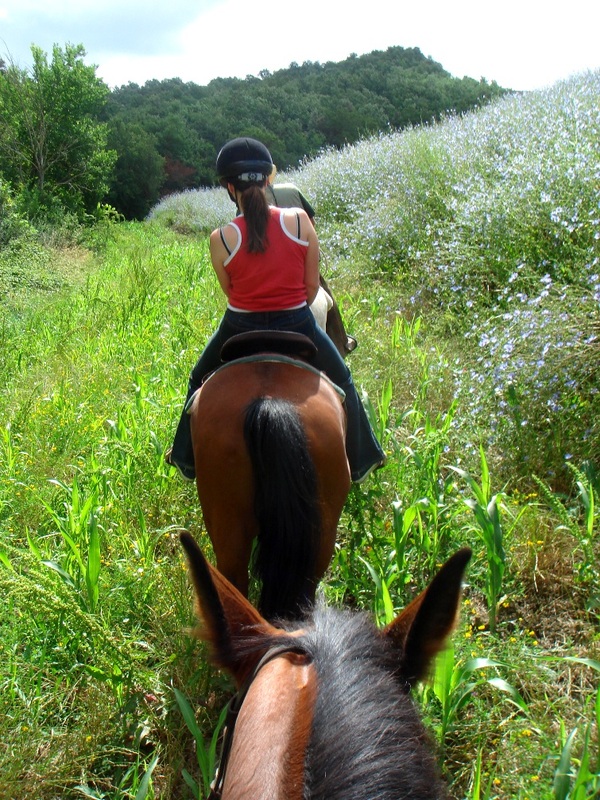 The rolling hills of Tuscany are the most inspiring location for fantastic horse-riding excursions with local guides. Discover breathtaking sunflowers fields, fresh woods, steepy vineyards, picturesque hilltop villages in our perfectly paced treks.